When customers arrive at any walk-in service facility, some form of check-in is required to set them off on their "customer journey". While a greeter's smile is clearly a very nice way to start anyone’s visit, most service providers aim to have the majority of their incoming customers use some form of self-service technology for checking in. Kiosks were once the default. They are ubiquitous and therefore customers immediately identify them as their journey's starting point – just like the historic "take a number" paper rolls used to be. However, kiosks have some significant shortcomings. Major drawbacks are the cost of ownership, occasional breakdowns, and the potential for security breaches. Cheap kiosks (often little more than a tablet on a pedestal) are fragile and are exposed to hacking and theft. Kiosks that are more robust and secure would cost considerably more. Kiosks, whether cheap or expensive, are a piece of equipment that contains components – computers, touch-screens, printers, wiring and so forth – all of which bear the wear & tear of regular use and occasionally breakdown and require maintenance. Today an alternative that costs way less than a kiosk, and offers a better customer experience is Q-nomy's myVisit. While primarily advertised as an easy-to-use mobile app for appointment scheduling, it also provides a very useful check-in option. A cool feature of myVisit’s check-in is the use of QR codes. 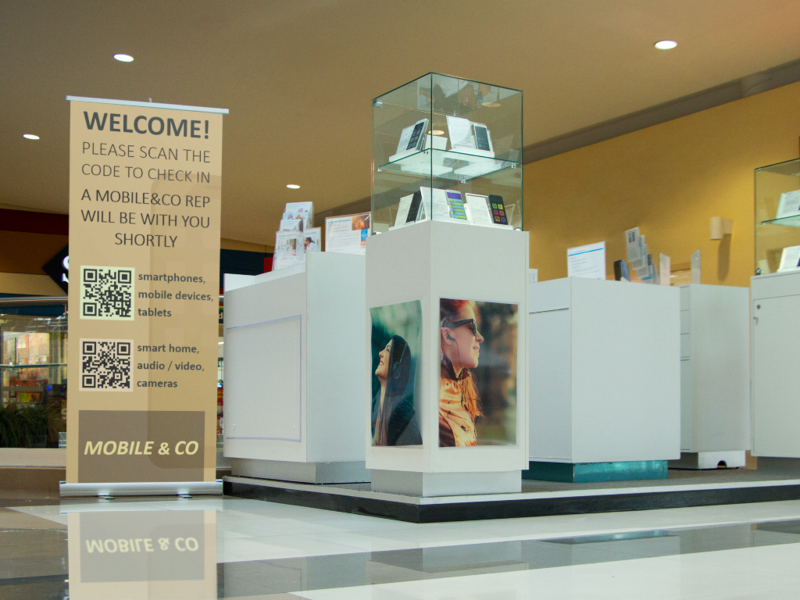 Instead of interacting with a kiosk (which can sometimes require standing in line) you check in to your appointment, or pick up your new phone at the store by simply scanning a code. So much easier and quicker than using a kiosk! Okay, the application might not wear a greeter's smile, but it’s friendly enough to set customers off on their journey, and the customers will smile knowing precious moments of their time were saved. The myVisit mobile app is available to all service providers using Q-Flow; Q-nomy also offers alternatives to using the public app. One alternative is creating a private, re-branded app with similar features, another is using the application's API to embed these features within the brand's existing app.